NOTES: I have always loved snow or winter based figures. 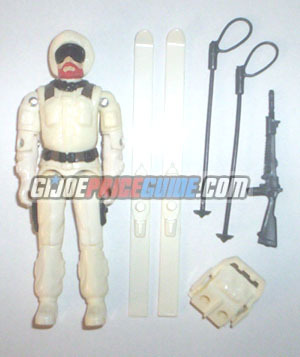 Snow Job was a favorite of mine as a kid because of the great snow outfit, but also because of his excellent accessories. Snow Job's skis and ski poles both attach to his backpack. The most important thing to look for in a Snow Job figure is white plastic. His white plastic often yellows like Storm Shadow from 1984. If you look closely, you can see that the right half section of the right thigh of the pictured figure is discolored.